In extensive talks with the Daasanach elders, Father Florian realized that the nomadic families want their children to be educated. 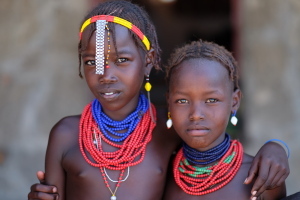 It became increasingly clear, however, that the existing primary school in Illeret does not suit the needs of the 15,000 nomads in the Daasanach homeland in Northern Kenya. First of all, there are far too few schools and these are located only in permanent settlements, the so-called manyattas. Attending a fixed school means that the nomadic children are separated from their families and forces them to give up their pastoral lifestyle. For this reason only very few boys are sent to school; boys who are not neccessarily needed for pastoral production. Beginning 2014, Father Florian and his Kenyan team initiated INES (Illeret Nomadic Education System), a project to establish a mobile school system that fits the requirements of the nomad families and takes into consideration their specific needs and interests. Aim of INES is to implement and run a sustainable mobile school system in the homeland of the Daasanach that provides boys and girls with basic education whilst retaining their traditional culture and lifestyle. From 2018 onwards mobile schools will be organized by Daasanach community teachers, who travel with the small family groups and provide schooling whenever and wherever they settle. Based on the Kenyan curriculum, subjects and contents are adjusted to the special needs of mobile pastoralists and cover the first three primary school years. The learning materials are based on traditional language and culture. The INES teachers have to be mobile pastoralists themselves, are chosen by the Daasanach communities and trained by the lNES team in Illeret. Ladders of learning and activity-based learning materials enable the students to study in multi-grade and multi-level learning environments.